I realise that I may be asking the impossible here... but I'm trying to avoid having to buy a pair of newly manufactured parts which I understand are often the cause of very harsh running vibrations. Does anybody have a pair available please to replace my ones that are well any truely past it? Alternatively is there a way of 'curing' these new parts to soften them? poly bushes can cause vibration if the shore is too hard but I've not heard of new rubber ones being too stiff if anything they are too soft and don't last as long as original ones. Some new Gearbox mounts sold for Sprint/1850 have turned out to be too hard causing noise and vibration, hence general adoption of Galileo's mod using a Volvo mount. I've tried it and it works! On engine mounts, as Justin says the general quality of replacements is poor with new mounts sagging rapidly or shearing rubber from metal prematurely. There doesn't seem to be a cure here, some folk on here have been discussing the possibility of commissioning poly type engine mounts but there seems nothing concrete (or even poly) in the pipeline so far. I might have 1 second hand OE one available that isn't past it. Have to check! These are the beasties, they have a 1/2"UNF (from memory, need to double check) centre threaded bit, and two holes in the "base" for 5/16UNF (or 8mm if you wish). The center fixing makes them handy for attaching an alternative bracket. Something as simple as a bit of box section steel would work, but not sure on spacing of the subframe fixings. Not at all sure these would work with a Sprint engine/subframe and the different mount system used. Though I can see how an 1850/TR7 motor could use them with an 1850 frame. I have looked at this and the XJ mount will be feasible for the nearside. It is the same height as the OE Sprint mount. Not feasible, in my opinion, for the offside though. Elsewhere it was suggested that a MX5 mount may work. I bought one of these to try but it is way too soft. This idea involves using rubber. I did look at manufacturing some poly ones made of an appropriate shore material or some better quality rubber ones. Unfortunately the project ground to a halt owing to lack of interest from the manufacturers I approached. I've retrieved the original mounts when I visited my car in Hungary last weekend and found them to be in remarkably good nick apart from the obvious creep that they've developed over 43 years so I may put them back in upside-down and in 21.5 years they'll be back where they started ! Obviously that would make the engine sit high initially which would affect both clearance to the bonnet and propshaft angle, though the latter only slightly. Has anybody done this before and can stop me if it's a daft idea? I've also measured the shore hardness of both these pair and a pair bought off t'internet and the difference is massive. The originals measure around 45, so would have been c.50 when new says a rubber expert I know, while the new ones are a rock-hard 70. Does anybody know the manufacturer of the new mounts that we can just ask to change the mix? Or maybe the club could commission them to make some softer ones 'just for us'? 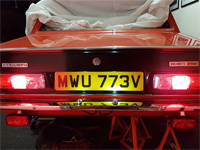 ANG triumph sell them so it may be worth having a chat and how do you measure the shore rating on manufactured mount? I wonder if this is something Chris Witor would be interested in? There seems to be enough demand for Sprint items.